Home » Latest News For Adults » Graphic Novels! Issue #6 – Owly! Today we’re looking at another all ages book and I seem to be sticking to my favourites as this series is right up there after Bone as far as I’m concerned…but in a different kind of way. Owly is an incredibly warm, sensitive little comic overflowing with heart and sincerity. Created by Andy Runton, (who I’m incredibly jealous of..) Owly is a series of manga sized volumes about an owl (called Owly funnily enough) and his pal wormy. Yep. That’s pretty much it. Whether its building a birdhouse, learning how to fly or making new friends the stories range in size from several per volume to a single tale. You won’t find any ongoing sweeping sagas or plot twists here but what you will find is beautiful art, wonderful characters and themes and just an enchanting world that kids (and some adults too! ) will love to delve into. The interesting things about these amazing little books is that there are no words at all. Everything is conveyed through the art, the acting and through symbols in the word balloons. Its a really great system and my kids and I really love ‘reading’ these books together and deciphering what Owly and Wormy are trying to say. We have volume 2 and volume 3 in the library at the moment but should have all five volumes on the shelves soon. If you want to learn more about Owly, go forth and clicky click on this here link to visit Andy Runton’s site. 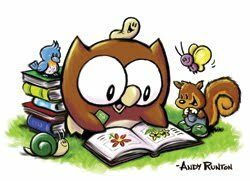 Andy’s just announced an Owly picture book to be released soon so that’s nice! There’s heaps of content on the site; you can see various drawings of Owly dressed up as other characters (Batman for instance), check out fan art, illustrations, download desktop backgrounds for your computer and colouring pages as well as watch videos on how to drawn Owly and more! Check out some of Andy’s interviews. Parents (or teachers), there are also lesson plans on the site for using Owly in an educational capacity which is also nice.